When taking unscripted photographs on the street, most photographers don’t want to pull out a lengthy contract for their subjects to sign. Therefore, it makes sense to carry along a scaled down version of your standard model release. Photographing people in public view does not require their consent. However, if the subjects will be recognizable, it is always a good idea to obtain a model release. If you plan to use or license the image commercially, it is a necessity. Without a model release, you could face litigation involving claims such as invasion of privacy and defamation. 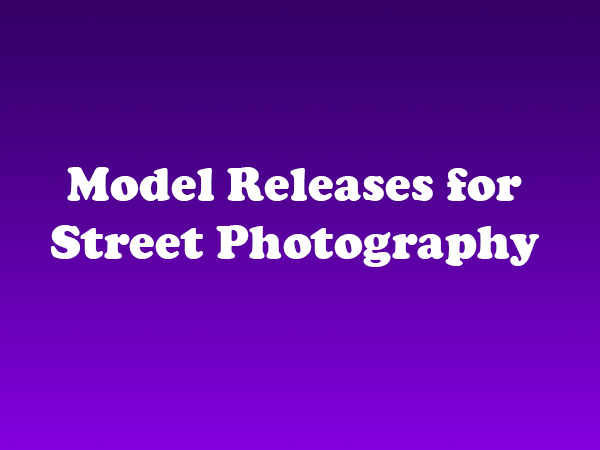 Scaled-down model releases—often called pocket releases—don’t provide the same level of legal protection, but photographers often find that subjects are more willing to sign a short agreement rather than a complex legal document. For valuable consideration received, I grant to Joe Photographer (“Photographer”) and his/her legal representatives and assigns, the irrevocable and unrestricted right to use and publish photographs of me, or in which I may be included, for editorial, trade, advertising, and any other purpose and in any manner and medium; and to alter and composite the same without restriction and without my inspection or approval. I hereby release Photographer and his/her legal representatives and assigns from all claims and liability relating to said photographs. Since the release still contains legal terminology, you should be prepared to explain the provisions. Subjects also often feel more comfortable if you can tell them what you plan to do with the images, i.e. publish in your online portfolio, sell to a stock photo company, or display as fine art. Advertising agencies, public relations firms, and other media companies are always looking for compelling street photography. However, most are unwilling to purchase images without model releases. Therefore, it literally pays to keep a few releases in your camera bag. You don’t want to lose an opportunity to sell your work simply because you weren’t prepared. Is the Nikon D750 the Best of Both Worlds?